Remote, yes. Home to the fictional Number 1 Ladies Detective Agency, yes. And thanks to a low volume tourism policy, Botswana remains blissfully unspoiled. And yet, it is a country whose star is clearly on the ascendancy. Anointed by Lonely Planet as one of the ‘Hot Destinations for 2016’, its popularity as a safari destination continues to grow. This month also marks its 50th year of independence, with the landlocked African nation hitting the big screen with the launch of high-profile film, A United Kingdom, starring Rosamund Pike, David Oyelowo, Tom Felton and Laura Carmichael, which tells the story of Botswanan prince Seretse Khama, who later became Botswana’s first democratically elected president. So what makes Botswana so special? Well for start, it’s hard to go past beautiful landscapes and the quality and abundance of wildlife. Then there’s its rare combination of desert and delta. The Kalahari Desert makes up more than 80% of this landlocked country, and the vast sponge into which the swollen Okavango River disappears each year creates the largest inland delta in the world – the Okavango Delta. 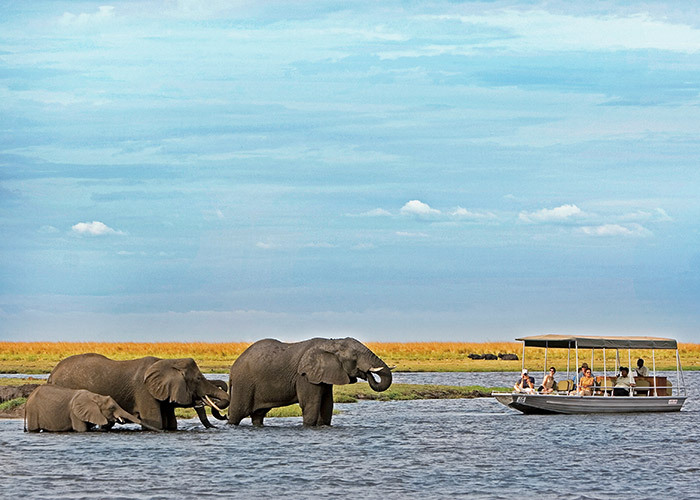 And in the northwest of Botswana, lies Chobe National Park, home to the largest population of elephants in the world. Over 17% of the country is dedicated to national parks, and in 2014 the Okavango Delta became UNESCO's 1,000th World Heritage Site. That means a Botswana safari offers up varied safari holiday across a broad expanse of savanna, desert, saltpan and wetland in one of the most pristine wildlife destinations in Africa. In what is also one of the most sparsely populated countries in southern Africa, a safari here is an intimate experience where close-up game viewing is the norm and boutique safari camps the ultimate home-away-from-home. There is a multitude of ways to acquaint yourself with the wildlife - on a gently poled mokoro (traditional dug-out canoe) trip through the waterways, by open 4WD vehicle, from the air and on foot – you won’t be disappointed. Located an easy hours’ drive from Melbourne, Geelong and its neighbouring peninsula - The Bellarine, are the ideal destinations for a day trip, weekend getaway or extended summer holiday. Here are 10 reasons to add this beautiful part of Victoria to your must-visit list this summer. Destination dining – Geelong and its surrounding areas are home to some of the best regional dining you will find in Australia. A must visit location in Geelong is Aaron Turner’s IGNI, which has won numerous accolades since opening earlier in the year. On the Bellarine, you will find Jack Rabbit Restaurant, Oakdene Vineyards Restaurant, The Shed Restaurant at Terindah Estate and the Vue Grand Hotel. To the north of Geelong, Matt Dempsey’s Gladioli has well and truly put Inverleigh on the gourmet trail, while his second restaurant in Geelong, Tulip, continues to impress guests from near and far. Old becomes new – as Geelong moves further away from its industrial past, old manufacturing spaces are being taken over and converted into hip new cafes, bars, restaurants, accommodation and attractions. The new Devlin Apartments, which opened in April this year, boasts 37 luxury self-contained short stay apartments and rooms and is located in the heritage listed former Gordon Junior Technical School. Nearby, Little Creatures Brewery and White Rabbit Brewery & Barrel Hall have firmly imprinted themselves at the site of the old woollen mills. The Old Paper Mills at Fyansford, established in the 1870s and located along the Barwon River, has quickly established itself as an arts and culture precinct with an onsite gallery and an onsite winery and function centre set to open soon. Back in town, Boom Gallery located just off Pakington Street, is a vibrant contemporary art and design gallery housed in an historic woollen mill. Cool urban precincts – Geelong boasts two inner city precincts where visitors will find cool cafes, wine bars, restaurants and designer shops. In the heart of the city, along Little Malop Street, you will find some of the best coffee in town at Coffee Cartel, an impressive selection of local wines at Geelong Cellar Door, Nashville-style chicken at Aaron Turner’s Hot Chicken Project and decadent late night desserts at Armageddon Cake. 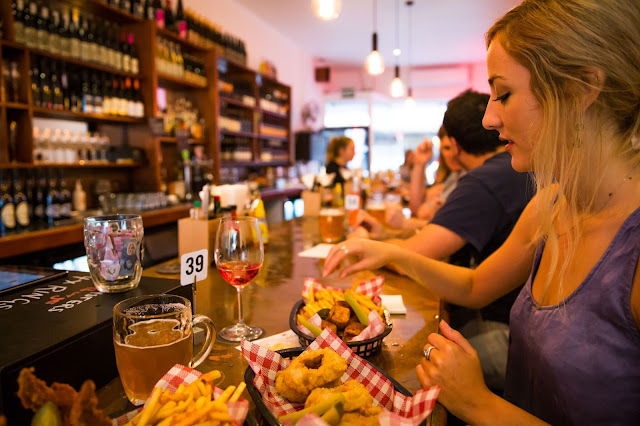 Just outside the city centre, Pakington Street is home to many of the most popular venues in town, including King of the Castle, Zigfrids Dining Hall &Bar and Geelong Fresh Foods, just to name a few. Amazing beaches – All summer long, visitors flock to The Bellarine to enjoy the region’s beautiful beaches. Avid surfers head to popular surf spots such as 13th Beach or Raffs Beach in Barwon Heads, while beginner surfers can enjoy a surf lesson at Ocean Grove beach with Go Ride a Wave or Sea Earth Adventures. Families can take advantage of the pristine sand and gentle waves at the Ocean Grove main beach, considered one of the safest in Victoria. Whereas the mouth of the Barwon River in Barwon Heads is the ideal location for paddling in the shallow water, exploring rock pools or gliding over the smooth water on a stand up paddle board. Other must-visit beachside locations include exploring the rock pools at Point Lonsdale and the sheltered and family friendly bay at Portarlington. Bountiful local produce – The Bellarine is home to an impressive collection of boutique wineries, farm gates, provedores and establishments serving up dishes featuring local produce. The best way to discover them all is by picking up a Bellarine Taste Trail map, which will take you on a delicious journey through the region. Or check out the detailed website, which includes all the information you need to plan your gastronomic journey in advance. Untapped wine region – the Moorabool Valley, to the north of Geelong is home to quaint villages, rolling hills, beautiful scenery and award-winning wineries. The region has a history stretching back to 1842, when Swiss immigrants planted the first vines. It is now considered one of Australia’s finest cool-climate wine growing areas, which can easily be explored on a leisurely weekend away. Top wineries to add to your must-visit list include Clyde Park Vineyard and Bistro, Lethbridge Wines, Moorabool Ridge Vineyard and Austins & Co.
A water lover’s paradise – with a spectacular coastline hugging the region from Geelong right through to Barwon Heads and beyond, it’s no surprise that you will find plenty of water based activities to choose from. You can discover the region’s rich maritime past and get up close to nature on a tour with South Bay Eco Adventures, swim with the dolphins with See All Dolphins Swims or cruise between the Bellarine and Mornington Peninsula’s aboard Searoad Ferries. For underwater adventures, Dive Victoria offers diving trips to explore the ex HMAS Canberra which was sunk into Port Phillip Bay in 2009. Tours depart from Queenscliff Harbour. Outstanding public golf courses – The Bellarine is a golfer’s paradise, boasting four outstanding public courses which are consistently rated as some of the best in Australia. Take your pick from Curlewis Golf Club, Barwon Heads Golf Club, or one of the two courses at Thirteenth Beach Golf Links. Add golf courses at Queenscliff (sitting on the scenic Swan Island), Portarlington and Point Lonsdale to the impressive list of courses on offer and you will see golfers truly are spoilt for choice in this part of the world. Two wheeled adventures – whether you prefer loose shorts or lycra, the Geelong Bellarine region is home to various cycling trails suitable for all abilities. The You Yangs are the go-to place for mountain biking, boasting two designated mountain bike areas with 50 kilometres of track. The Bellarine Rail Trail is a scenic 35 kilometre trail that winds from South Geelong to Queenscliff. This mostly flat trail provides easy access to many of the regions attractions and villages. Meanwhile, thousands of visitors flock to Geelong in January every year for the Cadel Evans Great Ocean Road Race. Cyclists can join Cadel himself in the People’s Ride which starts and finishes in Geelong. Endless family fun – in both Geelong and The Bellarine you will find ample activities to keep the family entertained. 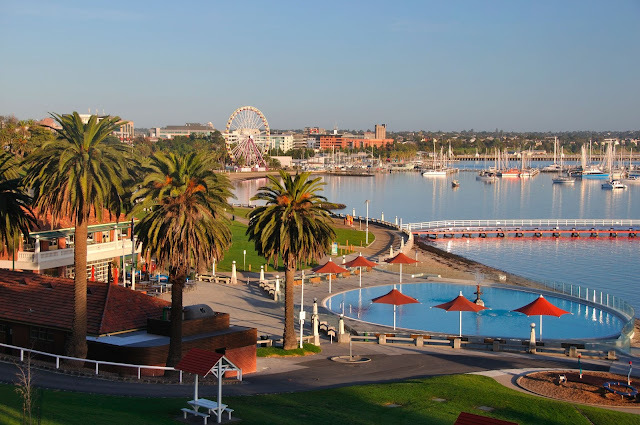 In Geelong, the stunning waterfront truly comes alive during summer, the youngest members of the family love discovering the old world charm of the beautifully restored Geelong Carousel, while the older kids will love the diving boards at the historic early century beach promenade at Eastern Beach. All members of the family will enjoy exploring the colourful Geelong Waterfront Bollard Trail, comprising 104 bollards, each representing a different character from Geelong's history. Out of town, you will find the hugely popular Adventure Park, which houses a diverse array of water and land-based rides that cater for the whole family. The wider region also boasts a large number of award-winning, family friendly holiday and caravan holiday parks, providing the ideal place to base yourself for a few days, a week or longer. For further information go to www.visitgeelongbellarine.com.au.